It contains 3 times more warming agent, VBE (vanillyl butyl ether). It will exceptionally support gamma-linolenic acid (GLA) to condition your skin.Rare fermentation oil, mortierella alpina oil contains a lot of GLA (gamma-linolenic acid). This body oil contains about 30% of the mortierella alpina oil as base oil.Recommended for who suffers from stiffness of joints or edema from poor circulation. 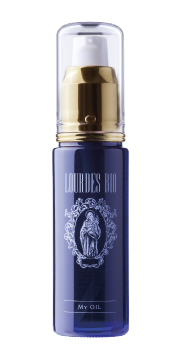 * We recommend that you start out with LOURDES BIO BODY OIL (BLUE BOTTLE) when you have never used the LOURDES BIO serious before. We ask you to check with our agreement at the time of purchase.Please read carefully about the product before the purchase. Thank you for your attention. * These oils are 100% certified organic,natural,safe and soothing oils. Apply proper amount to neck, shoulders, back or whereever you feel stiffness or poor circulation. It helps to increase circulation to decrease stiffness or soreness. It is good for joint acheness (neck, shoulders, upper back or lower back), muscle aches/soreness, back pain, tendiniits, arthritis, stiffneck from office work/prolonged computer use. You can also use anywhere you feel stiffness. •Please apply to dry skin. We recommend using to dry skin. The warming agent, VBE has reactive characteristics to water contents. Please avoid using this product after taking bath or combined with water-based products. •It varies how you feel the warm sensation. 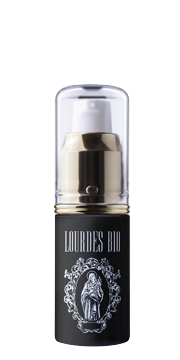 Please apply small amount on your skin first to test how it react,then adjust your use accordingly. •Please avoid using when you have irritated or damaged area..
•It may stain fabrics, wash your hand after use. •Stop using immediately when you have any allergic reaction or caused irritation.